What’s the difference between the Apple iPad Air 2019 and iPad Pro 10.5? That’s what you’ll find out in my newest tablet comparison. This is the new Apple iPad Air 2019. Are the new Apple iPad Air 2019 and the iPad Pro 10.5 the same tablet? That’s what you might think at first sight because they look very similar. And indeed, they’ve got a lot of similarities. However, there are some important differences. What are they? That’s what you’ll find out in my newest tablet comparison. 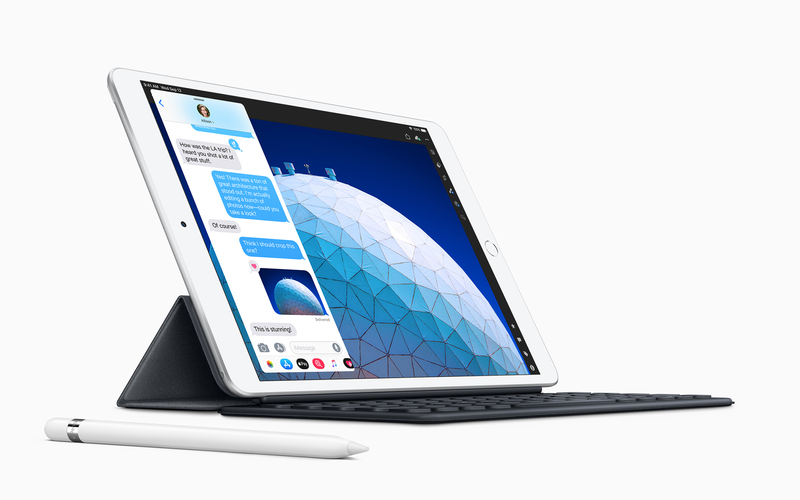 The main differences between the iPad Air 2019 and iPad Pro 10.5 are the processors. While Apple is using an A10X Fusion chipset in the Pro, the new Air features an A12 Bionic SoC. Sure, the A10X used to be the fastest processor available at some point. But Apple improves a lot every year and by now, the A12 is more powerful. With that being said, the A12X of the newest iPad Pro lineup is still a bit faster. I should also note that you can get 64GB, 256GB, and 512GB of internal storage with the professional tablet. On the other hand, Apple is offering the Air with 64GB and 256GB only. This is the iPad Pro 10.5. Looks like an iPad Air 2019 right? You’ll notice another major difference if you like to listen to music or watch movies with your tablet. The iPad Pro 10.5 has four very good speakers placed along the frame. That means you’ve always got stereo feeling no matter how you hold it. Sadly, that is not the case with the iPad Air 2019. That one has two speakers placed on the bottom only. So, the sound is coming from one side alone. The cameras are not the same either. While the 7-megapixel FaceTime cameras should be identical, the Air has an 8-megapixel camera on the back. However, the Pro has a higher-resolution 12-megapixel sensor. Even though Apple did not confirm it officially, I’m pretty sure that the displays of the iPad Air 2019 and iPad Pro 10.5 are the same. Well, at least almost identical. I Think that is the reason why Apple went with a 10.5-inch screen instead of a 9.7-inch one. They’ve still got some lying around or at least in their production lineup. And it should be cheaper than the new 11-inch one for their newest Pro. Well, both tablets have a 10.5-inch screen with a resolution of 2224 x 1668 pixels. Both screens are laminated, got an anti-reflective coating, and are True Tone displays. That means the white balance is adjusted automatically based on the environment you are in. Additionally, both support the same original Apple Pencil. There is one difference though. The iPad Pro 10.5 supports Apple’s ProMotion technology which means it can display up to 120Hz. With the new Air, we get 60Hz only. iPad Air 2019 and iPad Pro 10.5 look almost identical. That’s because the body is almost identical. Both are just 6.1mm thin and both have a home button placed right underneath the screen. Touch ID is built-in as well. Oh, and we do get a standard headphone jack and a Smart Connector for exactly the same Smart Keyboard. Which is the better iPad? So, which is the better iPad? Especially if you care about performance, the new iPad Air 2019 is the clear winner. The A12 Bionic SoC is much faster than the A10X and should feel fast for years to come. However, if you care more about sound, you do get four speakers with the iPad Pro 10.5. The software should be identical for the next couple of years anyway. Apple is really good with that. And please, compare prices. The iPad Pro 10.5 should be cheaper than the iPad Air 2019. If that is not the case, I wouldn’t go for the Pro 10.5 anymore. The Apple iPad Air 2019 is one of the best tablets you can get right now. It offers a pretty screen, very powerful hardware, and a premium build quality. Other aspects like Touch ID, Apple Pencil support, optional keyboard, and battery life are good too. At the same time, it will be kept up to date longer than most competitors.